The 1st annual Preakness Party last weekend here at La Cucina Castano was a fun day. Good time had by all. 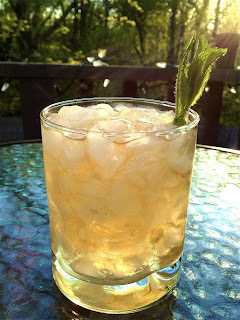 And the drink of the day was the traditional drink of the Preakness - the Black Eyed Susan. 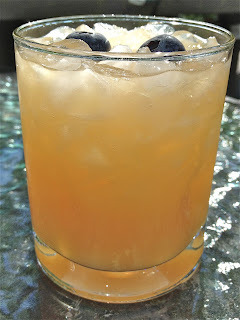 As I stated in my last post, the idea was to take certain elements from all the numerous different recipes for this drink to come up with a starting point. I was then planning on getting into some experimental mixology and adjusting the drink recipe throughout the day (and evening) to come up with the ideal cocktail for the Preakness. However, it didn't go quite according to plan. What happened was that the first version of this cocktail proved so popular with the crew that I stuck with it all day and didn't change the recipe. Half orange-pineapple juice. The other half was a mix of vodka, white rum, triple sec and blueberry infused simple syrup (home-made of course). Don't ask me proportions on the alcohol - you know I'm not big on measuring anything. The drink was garnished with frozen blueberries. They served as the 'black eyes' in the Black Eyed Susan. Honestly the drink, while somewhat refreshing, was a little weak for my tastes. I thought it needed a little more bite, a little more heft. I like to taste the alcohol in my cocktails. But being that the majority of guests were more beer and wine (as opposed to cocktail) drinkers I think the lack of overpowering alcohol taste or bite appealed to them, so that's what we rolled with. I still plan on experimenting with this drink (while staying in the spirit of the cocktail, if there truly is one) to come up with the ultimate Black Eyed Susan for the 2nd annual Preakness party next year. Cut down (or out) on the juice - I'm not big on juice in my cocktails. Perhaps get some acidity from lime instead of orange. Maybe substitute whiskey for rum for a little more depth. Try and work in a little mint. St Germain comes to mind as an intriguing option somehow. I'll keep working on this drink throughout the next year so that come next May I can give you the ultimate Black Eyed Susan recipe. So, until next time, enjoy the holiday weekend (for those of you in the USA). And, as always, take the time to relax and enjoy a well made cocktail. Well it's been two weeks since since the Kentucky Derby which means only one thing - The Preakness Stakes, the second leg of the Triple Crown, is today. Plans fell through to have the first Derby Party here at La Cucina Castano two weeks ago - an all day middle school lacrosse tournament the same day put the kabosh on that idea - but a few friends did stop over to watch the race and yours truly certainly had quite a few mint juleps in honor of the race. Since a Derby party was not to be we decided on the next best thing - a Preakness party. Some recipes have rum, some have whiskey, a few add triple sec or grand marnier. I've seen both pineapple juice and lemonade listed in some recipes. Limes, lemons, oranges, cherries, simple syrup, you name it it's probably been in a Black Susan recipe at some point. Google the drink recipe and you'll be amazed at how many versions you come up with. This inconsistency of recipes and ingredients, I think, makes this drink a perfect fit here at La Cucina Castano. Cooking and mixology are all about the creative process. Take something standard or simple and then riff on it until you come up with something unique and fun .... and tasty. Kind of like jazz in the kitchen or behind the bar. So that's what I'll be doing today as friends gather here for our first Preakness Party. Taking what I think are the best elements of the various recipes I've found and getting into some serious mixology until I come up with my own best version of this drink, which will then become the standard bearer of Preakness parties to come. I'll let you know what I come up with. Until next time .... Enjoy the weekend. Enjoy the race if you will be watching. If not enjoy whatever endeavors you set forth on. And as always - eat well, have fun and enjoy a tasty cocktail. It's Cinco de Mayo this weekend, but we won't be talking about tequila, because it is also the first Saturday in May, which means two things - The Kentucky Derby and Mint Juleps - and that means bourbon. So we'll be talking about this traditional Kentucky Derby drink. I make mine a little differently. It takes a some preparation beforehand but I think it's worth the effort. 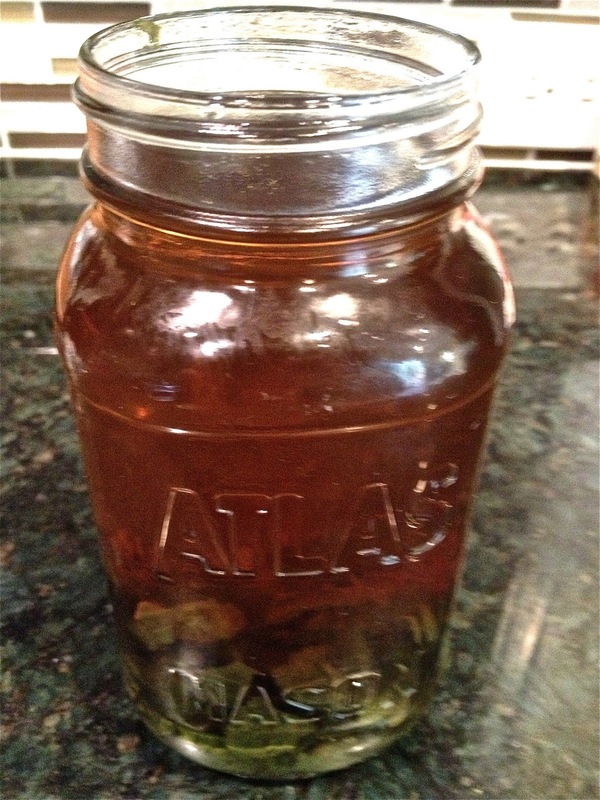 Step 1 - infuse your bourbon with mint. For a mint julep I go a little old school with my bourbon, nothing fancy or top shelf, just some good old Jim Beam. 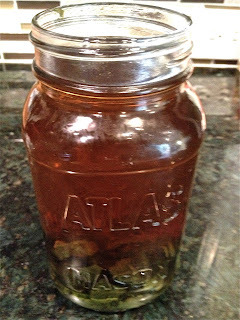 Chop up a whole lot of mint and put it in a big mason jar with a bottle of bourbon. Let it sit in the fridge for about a week or so. Strain so you get all the mint out and your ready to go. Step 2 - mint infused simple syrup. Simple syrup is easy. Equal parts sugar and water. Boil the water until the sugar dissolves. While it's boiling add a bunch of mint. Once the sugar has dissolved turn off the heat and let it cool, leaving the mint leaves in. Once it's cooled, strain the mint out, pour it into a container and stick it in the fridge until your ready to use. Stpe 3 - ice. Shaved ice is best, crushed ice will do in a pinch (and what was used in the picture up top, since I couldn't generate any shaved ice). I have found that a snow cone machine works best. Just get a small portable one for $20 bucks or so. Ours is broke so I need to go get one before post time. Step 4 - prepare. Fill a glass to the brim with shaved ice. Pour a little bit of the mint infused simple syrup in and then fill the rest of your glass up with your mint infused bourbon. You can make it as sweet or strong as you want - just adjust your ratio of bourbon to syrup. Garnish with a fresh mint sprig. Step 5 - drink. It really is a tasty, refreshing drink. I generally only drink this once a year on Derby day. I think that this year it may become a staple at the poolside bar here at La Cucina Castano. Have a great weekend, enjoy the Derby, pick a winner and enjoy a delicious cocktail (if not a Mint Julep then one of your favorites).